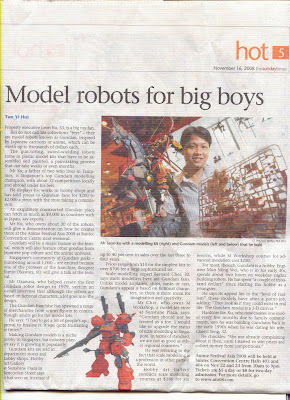 I came across one interesting article in the Straits Times last Sunday, an interview with Mr Leon Ku, one of our local gunpla pros which (if I'm not wrong)is a first for the Gundam Modelling. I thought that this was long overdue. And Mr Ku is the perfect candidate for this considering the trophies he has amassed over the years. It is about time to create some awareness to this hobby and it is better late than never. I always have this problem of people commenting that "we are just playing with toys". To me, it is demoralizing. I take pride in doing Gundams and there is no bigger satisfaction derived than completing a model kit and to have it displayed to inspire others to do theirs. However, I understand that our gunpla community is small compared to those in Japan, HongKong or even Malaysia. Well I guess that youngsters nowadays are more "into" computer games and other sports. Doing Gundam would requires time and effort which could be a deterrent for these young folks. To improve the overall standards of our Gunpla modellers could be a daunting task. In the recent BAKUC (Bandai Action Kits Universal Cup), a regional gundam competition, I am seeing more attractive entries in other countries compared to Singapore. There is a lot of room for us to improve! Looking forward, I think we are all on the right track to make this hobby more popular and I hope for the day where people will recognise Gunpla as serious business and not some kiddo stuff for the young. Well....see you folks at AFA!